What strikes one first about artist Scott Ligon is his ability to grasp complex, creative abstractions–interpreting unwieldy data into useful, articulate information. Surely that has something to do with his role as Coordinator for the Digital Foundation Curriculum at the Cleveland Institute of Art. Scott Ligon (SL): Thank you Max. I appreciate the opportunity. ME: There’s so much I want to talk about, because you’re doing so many exciting things, but let’s start from the beginning. Where did you grow up? SL: I grew up in the Washington DC suburbs, in Fairfax VA. I’ve always considered DC my native city. ME: And what made you decide to become an artist? Was there a decisive moment? SL: I was always interested in creating all kinds of things, including writing, drawing, making 8mm movies and writing music. I think that’s a big appeal of digital art, that I can synthesize all these different interests. I was a big comic book fan growing up and I learned to draw from studying comic books and the later making my own. When I made those comic book drawings, starting at age 11, that was probably the first time that I considered myself an artist. ME: You’re also a bit of an art theorist too? I ask because shortly after we met, a couple months ago, I invited you to write a guest article. You accepted, and that piece was published last months at AD Mag, speaking to the issue of whether or not Digital art is a “metaphor” or “medium.” For those who haven’t read the article yet, recap for us. And if you will, tie it in with any other intersecting ideas that you may have contemplated as well. SL: Digital technology has no inherent characteristics. Rather than a medium as it is traditionally defined, digital technology is more like an invisible, enabling structure from which things can be created, like atoms in the physical world. As the physical and the digital worlds become more and more seamlessly integrated, it might make sense to consider digital technology and digital art in a broader context. Beyond that, I’m simply a very vocal advocate of digital art and the world changing potential of digital technology. 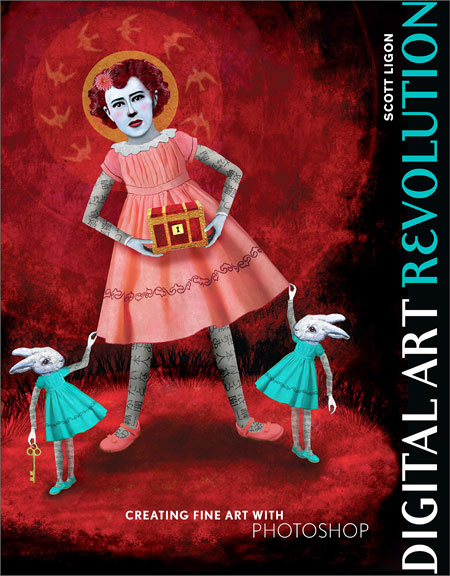 “Digital Art Revolution” is definitely written from that perspective. I’ve always been interested in taking a philosophical, “big picture” approach to any given subject. This is kind of embarrassing, but I often have inner dialogues where I’m debating both sides of an issue in my mind, in order to try and understand it. My wife will often see me lost in thought, gesturing a little and tease me about it, knowing I’m debating a fictitious person in my mind. I never set out to be a theorist about anything, really, but I’ve always liked ideas and I like asking questions. ME: So, you’re married—your wife is an artist too? SL: Yes, my wife is Laura Sherrill Ligon. ME: What does she do, her genre, and is there some collaboration between the two of you that takes place? SL: She is a painter. We met in graduate school at Maryland Institute College of Art. We haven’t really collaborated in a literal sense, although we’ve had some two person shows together. I love her work, and I think that working in proximity of each other for so long has really influenced both of us as artists. She’s also a good and trusted source of feedback for my work. ME: Any other family members who are artists? SL: My sister is a painter. I have two sons, ages 10 and 13. They’re both creative and eccentric, but I’m not sure they’d identify themselves as artists at this point, although the youngest draws quite a bit. ME: I’ve been reading your book “Digital Art Revolution”, which we can discuss more in a moment. Yet because its so well put together—such a seamless read—I’m curious to know how long it took you to write it? SL: Oh god. It’s been a very gradual process. It took about three years to get from book proposal to the final book. Once the book was sold and the basic structure agreed upon, the final draft of the book was written in about ten weeks, including creating the exercises. Many sleepless nights! ME: I’m sorry to hear about the sleepless nights, but the quality of the book shows real dedication. I’d like to bring in some art, asking you first about the cover image you chose for the book. Who created that and why, out of all the artwork you could have chosen, including something from your own portfolio, did you choose that piece to lead the way? 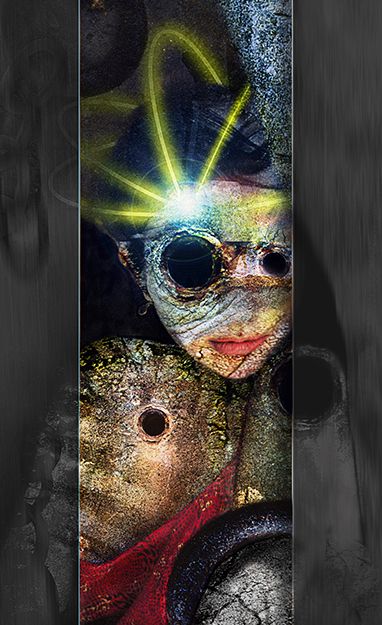 SL: The cover art is by Cindy Jerrell. Cindy is an artist in Athens, GA. She’s won a Georgia Council for the Arts Individual Artist Grant for mixed media work twice. I like her art very much and included several of her images in the book. The cover, however, was selected by Random House. I was not part of the process of selecting an image for the cover. The publisher invests a lot in a book as a commercial product and they have experience selecting images with mass appeal. From what I understand, it is fairly typical among large publishers that they will select the cover. Why do you ask that, and what response do you give to such a question? SL: I think there are a lot of fears and misconceptions about digital technology, especially among older artists. On the other hand, many prominent art shows have placed an emphasis on digital art in the last few years, which has caused some people to say things like “painting is dead”, as if it had become old fashioned. My response to that question is “no”. Painting and drawing, I believe, will never become irrelevant. Making a mark on a physical surface is a fundamental, primal act that is as relevant today as it was when people were painting on cave walls. People also said that painting was dead when photography was invented. Instead, photography inspired painting to move in new directions. Digital technology blurs boundaries and integrates with physical materials but it does not replace them. If digital technology replaces anything it would be other, older technological processes. ME: I’ve been revisiting your website over the last couple of months. Looking at your art, a few pieces jump out right away, like “Candy.” The proportions of the figure and items within the painting are well balanced—appearing photographic. And yet, the textured brushstrokes of the color and shapes in the piece are definitely painterly. Looking at “Candy”, I would say painting is alive and well. Could you talk about that piece? SL: My family has done several large trips across the country. 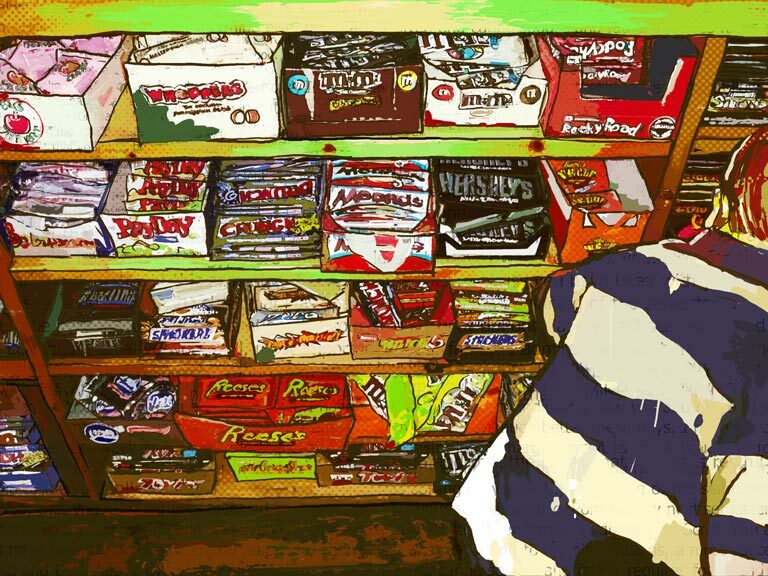 As we travelled, we’d often end up in a mom and pop store in some obscure location like the middle of a desert, using the bathroom and loading up on junk food. That part of the experience held just as much resonance for me as any other part of our trips and seemed representative of our journeys. 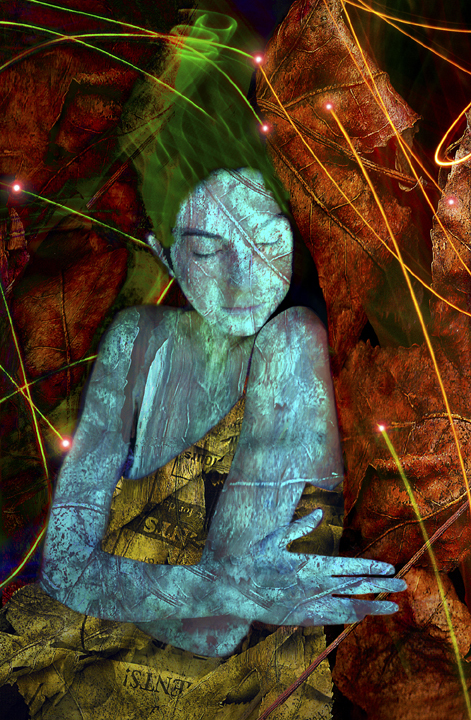 The piece is photographically based, using two different photos. 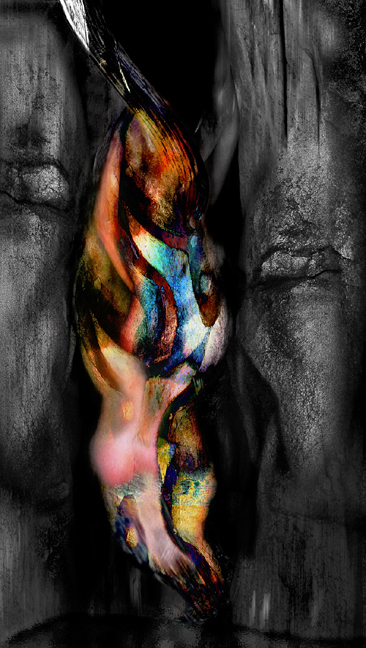 Some of my work is primarily painted (digitally) and some is primarily photographic, but I’m so used to integrating different approaches that I don’t really make a distinction between the two, except to acknowledge the source material. I was trained as a painter and I still approach everything I do from that perspective. My “Orange Man” piece in that same portfolio is a portrait that was drawn and painted but I actually used “Candy” as an underpainting for “Orange Man”. Integrating literal pieces of my work into other pieces, either recognizably or unrecognizably, ties them together visually. It’s also a chance to explore different tangents or possibilities suggested by a piece. ME: I’m glad you mentioned “Orange Man” because that was the next piece I was going to ask about. Who’s the person—what’s the story? SL: My dad. He passed away a few years ago and I was with him through the whole process, and it really effected me a lot. It’s easy to forget how impermanent we are until you experience death firsthand. It affected me profoundly and I’ve done a lot of work around my father and his passing. I did an installation video piece about this at the Washington (DC) Convention Center as part of a group show. When he died I realized I was the same age he was when I was born. Together we made a lifetime. This 12 second video is a montage of digital photos, beginning with my birth until the present, continuing directly into photos of my father from his forties until his death. It was created as a comment on the ephemeral nature of life. It’s on YouTube. ME: Now, when I look at your work—some of it, not all of it—I really see traces of David Hockney, the way the images seem to be shattered apart and reassembled…intentionally disjointed with scrappy edges. I’m aware that you studied under noted abstract expressionist, Grace Hartigan. So where’s the influence coming from here. Any favorite artists, mentors or idols? SL: I like David Hockney, so it’s possible he seeped into my subconscious. Grace is definitely an influence. There is a section in the book about “Mining a Vein”, about committing to an approach and finding a personal voice as an artist, that comes directly from conversations I had with Grace. When I look at the loose strokes of color in “Candy” I realize I’m really trying to make a digital version of the gestural paint drips in her work. Fellow abstract expressionist William DeKooning is also an influence. Picasso. Philip Guston. Robert Rauschenberg. I’m also completely and overtly influenced by pop culture and still have a strong comic book influence in particular. We’re bombarded by images in modern culture. 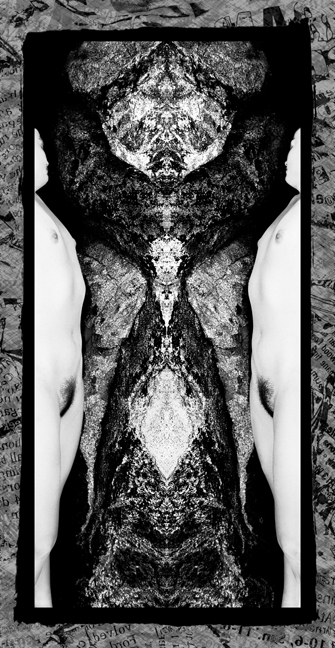 Fragmentation and reunification is a strong interest in my work. ME: Fragmentation and reunification is what I was getting at when I made the Hockney comparison—his mashed up, polyptych, photo montages. And when I think of pop culture and a bombardment of images, more broadly speaking, I see it as a bombardment of information. It can be overwhelming? SL: Yes, the information overload is overwhelming, and at the same time it’s tremendously interesting, at least to me. We are exposed to more images and information on a daily basis than we can possibly digest, so we try to focus selectively and then find or make connections between these disparate elements. I try to take all these different source materials, add to them and weave them together into something broad but unified. I look for potential connections. I’m a child of television. I’m a child of pop culture. This is what I am most familiar with from firsthand experience, and it is reflected in my work. It’s ironic I suppose, that digital technology has drastically increased this bombardment of information and at the same time has emerged as a perfect creative tool to synthesize and unify all this seemingly unrelated material. ME: A moment ago you talked about “Mining a Vein”, that’s in Chapter Nine: Finding Your Voice. How does an artist know when they’ve found their voice and what would you say, to someone who may not really know, is the purpose of an artist statement? SL: Minerals will be discovered in an area and then miners will dig and mine this “vein” until it’s used up, until it’s no longer practical to keep digging, because they’re not getting much in return for their work, and then they’ll look elsewhere. This is the metaphor for developing a personal style or voice as an artist. If we pick certain methods or techniques that have resonance with us and then commit to and practice those techniques, we get better and better at them. When some of these techniques no longer challenge or excite us it’s time to introduce new challenges to the mix, and “find another vein”. When we select, commit, focus and practice, we get so good at the technical part of our work that we no longer have to think about it. This allows for something personal and distinctive to develop. When an artist has found a personal voice, we see something in their work that is so specific that we look at a work and know it’s theirs. It is unique and intrinsically tied to who they are as a person. No one else does things in exactly the same way. Many artists tend to dread making artist statements, but an artist statement can be helpful because it forces you to be clear on your intent and your motivations. If you haven’t articulated what you are trying to do, it’s hard to have a direction, or gauge success. It you do it right, it’s not just a series of art-world phrases, but a personal manifesto. 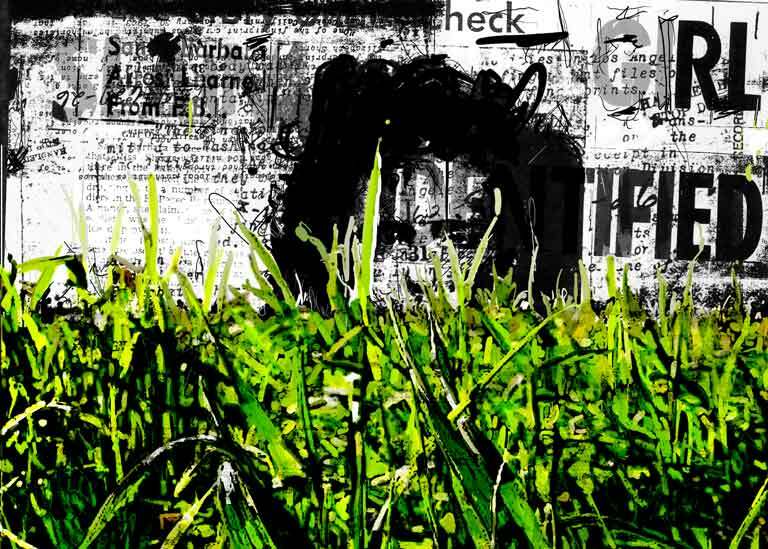 ME: I’d like to ask about another piece you created “Black Dahlia.” I like it, the contrasts—the electric green grass superimposed over grainy newsprint. Visually it’s striking, but I have no idea what the narrative is. SL: The Black Dahlia piece was created specifically for a group show in Los Angeles. The Black Dahlia refers to Elizabeth Short, an aspiring actress that was brutally murdered in Hollywood in the 1940’s. The Black Dahlia murder received very sensationalistic press coverage, and, I believe, was never solved. There’s still a lot of interest in this case, especially in Los Angeles. I had the assignment of creating a Black Dahlia work for this themed show. On the internet, I found dozens of pages of FBI documents about the case, and they all had really interesting textures. Lots of grain from bad photocopies, dirt, folds, scribbles, etc. I thought these documents actually had a really interesting and beautiful quality of their own. I made a montage of textures and text from these documents, added other textures, drew into them and built up the image on top of these documents. 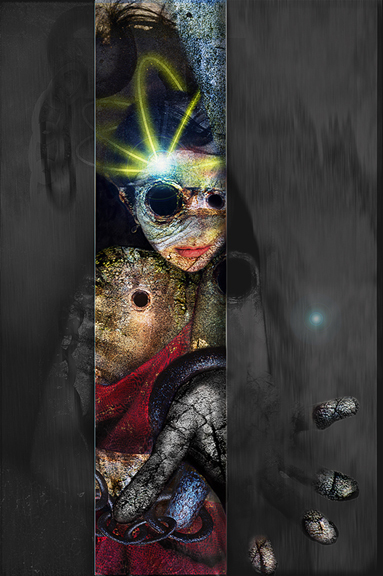 I like the idea of literally incorporating things into a work that are associated with its subject matter. ME: In your capacity as an educator, what’s the lesson of Digital Art Revolution? SL: A lot of Photoshop books that have “fine art” in the name are really about short cuts, or methods used to copy techniques associated with art history. “How to make your art look like Van Gogh”, for instance. Many of these books are very good but I thought there was room for another approach. Since the beginning of time, artists have been able to use the visual language to communicate a general feeling or quality through their work, even while creating something unique and personal. “Digital Art Revolution” takes those time-honored ideas of visual communications and combines them with the unprecedented new possibilities of digital art. These are amazing tools. We can use them not just to copy previous approaches but to invent our own vocabulary, appropriate to these new possibilities. We can use them not just to imitate art history, but to make art history. ME: Scott, thank you for your time. I’ve enjoyed talking about your art, your book, your many ideas. SL: Thanks very much, Max. I enjoyed it as well. Additional images of Scott Ligon’s artwork can be found in the AD MAG Artist Galleries, and a full 3-year archive of AD MAG articles and interviews can be found here. Visit the Ligon-Art website here. A master of the Adobe Photoshop pallet, artist Stephen Burns takes cues from last century’s masters to create his own visual landscape of grainy grays and vibrant colorfield hues. At times his work is photographic and figural, other times it’s pure abstraction. Burns lives and works in San Diego, California–teaching at various institutions, including the University of California at San Diego. His artwork has been exhibited globally, and he’s the author of many, many books speaking to the mastery of digital art techniques. Stephen Burns (SB): My pleasure to be here. ME: So tell us about yourself. Where’d you grow up, places you’ve been and where are you now…geographically speaking? SB: Okay, I was born in El Paso, and grew up in Chicago. Thereafter, I moved to California in the 1970’s. I was raised Catholic schools, in both California and Chicago. ME: Do you come from an artistic family—any siblings, uncles or cousins who are artists? SB: Yeah, my family has always been artistic. My dad was a painter and was always doing something with art. He was a business man–a salesman for medical companies. But he opened up opening a Southern-style restaurant in San Diego, which ran for 18 years. He was the chef. Other family members were artistic—musicians—but they never followed through with it long term, in a serious way. When I was a kid I had art classes. My friends were really artistic, drawing comic book characters. They drew what they saw and told me to do the same. I became hooked on drawing from that experience—spending a lot of time just drawing. Two of my favorite pastimes were building models and drawing. In our Chicago home, we had a basement, and in one of the corners of that basement was my little area to make models, which really connects to what I’m doing now. By Jr. High and high school, I decided that if I wanted to do something artistic I would do something that would make me money, which led me into drafting and now, 3-D digital art forms. ME: As you are probably aware, many of the people I’ve interviewed in the past are not just artists, they are also educators, curators and the like. From what I know about you, your involvement with the arts really exemplifies this dynamic. Could you give a brief run down of some of your organizational affiliations and educational titles? SB: I instruct at University of California at San Diego. I teach with an extension section there. It’s a section that deals with visual art called The Craft Center. I’ve been with them for about 10 years. Another place I teach is Irvine Valley College (IVC), where I teach a digital photography and Photoshop classes. I also teach Photoshop workshops nationwide. ME: You and I have a mutual colleague, Joe Nalven, who you’ve known much longer than I. Recently however, I interviewed Joe for AD Mag and we’ve also had several off-the-record email chats. Like you, Joe is an artist/educator. How did you guys meet? And I think more pointedly, what I’m trying to get at is that you seem like a hell of a networker, with Joe being just one of the key individuals you’ve allied yourself with. This gets into the business side of leveraging power and human resources, skills that many artists do not have. Right? What’s the relationship with Joe, and what would you say to artists who don’t quite grasps the ins and outs of the business side of art—cultivating career-related, relationship? SB: I’m the president of the San Diego Photoshop user group, which currently has 3,003 members. That’s where I met Joe. We are the largest Photoshop users group in the nation. Though when I took over, we only had 25 members. I built it up to 3000+. I built up my mailing list and connections by going out to the community, and the San Diego user group is part of that process. To do this, I went out and did a lot of presentations and lectures to schools and camera clubs, and other digital arts organizations. In the process, I was asked to write books. Also in the process of all my travels I began creating a following, which I’ve taken in the form of a mailing list, keeping all informed in what I’m doing–what is happening in the art world. I think a large part of marketing myself has to do with my great interest in giving back to the community, educating the community in this new way called digital expression. ME: So Stephen, you’ve written a few books, we’ll have to talk about that. And I’d also like to talk specifically about some of your artwork. But for now I’d like to ask about something you said on the PhotoshopSupport.com website. I quote: I like to challenge the viewer’s psyche through presenting the unknown. I combine the animate with the inanimate because we are inseparable from our environment and the energies that impact upon us. I kinda think I know what you mean there, but I’m not 100% sure, so talk more about this, because I find that statement rather fascinating. SB: I’ve always been as an educator a stickler about educating students to be unique and I have been influenced by the great American abstractionist painters. The philosophy with that movement was on creating with their gut instinct. Not trying to control, but instead allow the canvas to create—bring forth the creation. And this comes from a philosophy where as artist we utilize our subconscious. 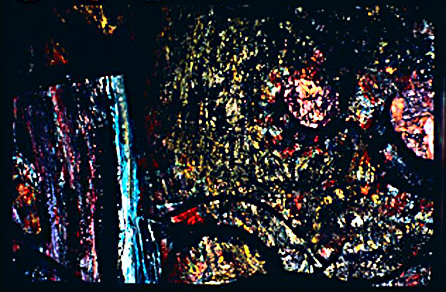 In the 1950’s during the abstraction movement, this was referred to as automatism. And I think that all this can be applied to digital art as well. So what I do in my work is that I take those things that are considered to be animate, human or animal forms, and I blend it with things that have little to do with life—metal and stone–taking the figurative, blending it together to create something unique. ME: We’ve had a few conversations over the last couple of months, but in our most recent chat you informed me that you’re working on a project with the digital tablet maker, Wacom. SB: I’m working with Wacom on an educational book. I’m one of Wacom’s pro-artists, and what that means is that they ask me to demonstrate their tablet in a creative way to other artists. So what I’m doing is bridging the gap between the technology and artistic use. The tablet is one of the single most important technologies on the market that brings together the traditional and digital ways of creating. The company is Japanese and Wacom the word stands for: Wa, which means harmony and Com is short for computer. ME: Wacom, meaning “harmony computer” is very interesting. I had not heard that before. However in looking at your artwork, I can see something of a connection there as far as dealing with transcendental or metaphysical subject matter, like with the piece called “Primordial Trance.” Might you talk about that? 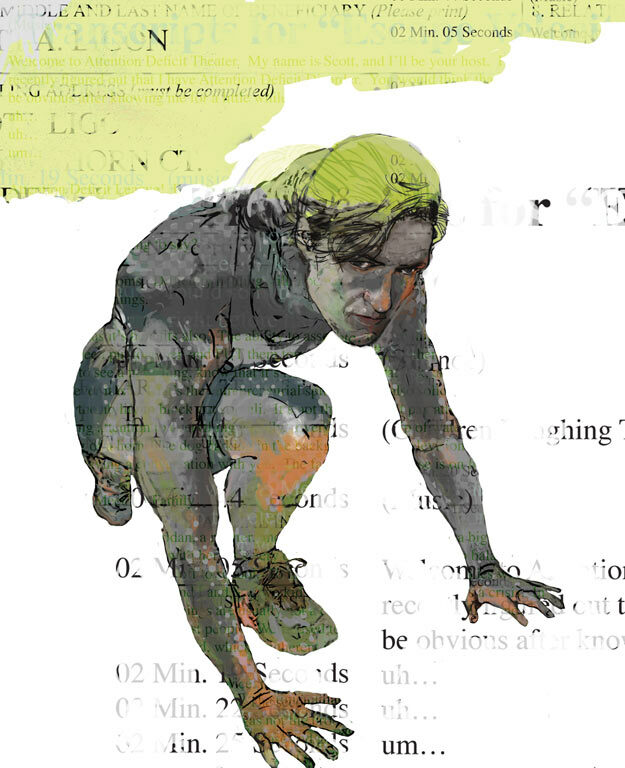 SB: Well, that piece…today there’s this whole movement to going back to figurative aside from abstract. We see that with concept artist, basically commercial artist who portray and idea theme or story. 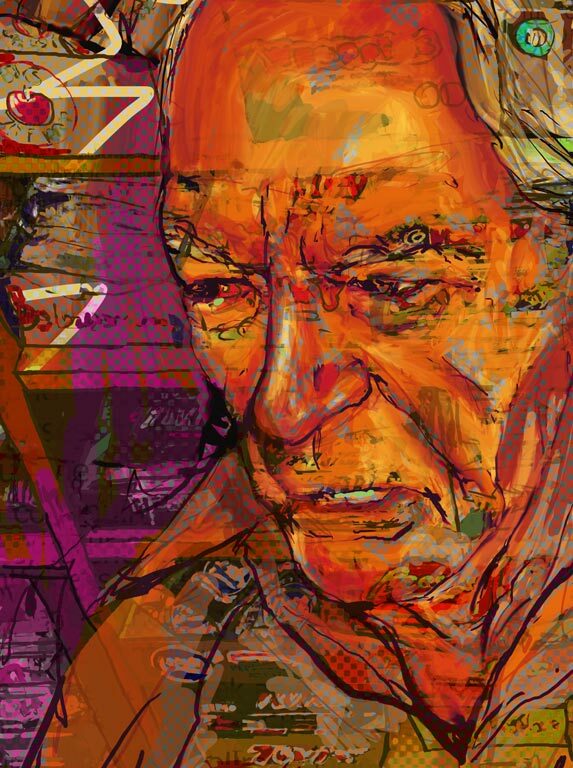 These are digital illustrators, using their talents. 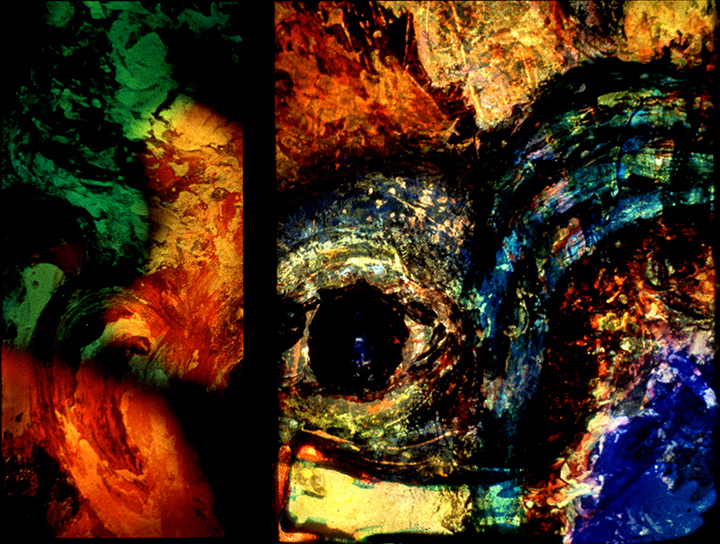 This piece is inspired to introduction to abstraction in the figural world, using the camera to represent in detail what my eye say, blending abstraction and realism together. This piece is earthy and tactile. It’s a feeling of nature, representing the base emotions of human beings, giving a sense of peacefulness—a focused trance. The lines are fluid, but yet theirs solid texture integrated with it—a connection to physicality. We are spirits in nature, connected to this physical world. ME: The piece entitled “The Prisoner” caught my eye too. I’ve never seen a prisoner like this before, so tell me about this one. SB: looking at the lines of the piece. Narrow lines often times portray restriction.. what were seeing is a figure, being the restriction behind two narrow plates. The hands stretching out are showing the chains around the wrist. Once again the concept of the inanimate and animate comes into play where texture and other forms are integrated with the figurative portraits. There’s symbolism going on through the shapes as well as the definitive objects like the chains on the characters wrist. I meant for this piece to be ambiguous, meaning that the viewer should decide what the prison is, is the prisoner alcohol, prejudice or social indifference? We all have exposure to some sort of prison. ME: Some years back you did an exhibition which you called “Architecture of the Spirit.” What a great theme. Could you talk about the premise of that exhibition—how are you using the word architecture, tying it to spirit? SB: Um, I was raised catholic as I mentioned earlier. I have a firm belief and conviction that we are far more than just physical. We continue to live on after these bodies die. And yet all we understand is life and death in this world. So, as humans we are constantly studying the architecture of the human form, asking how blood flows, how arteries react, how the body functions in this physical world. My Catholic upbringing has always helped me to understand the architecture of the spirit. What is the nature of the human sprit who are we really? Right now, I believe humans are both physical and spiritual. There will come a time when we will be spiritual. What we experience now and how we develop ourselves now, is the very thing that goes with us as this physical body passes away. The question is: What is the architecture of the spirit? What is it really? 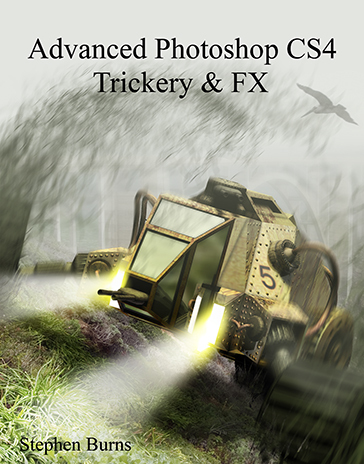 ME: One than one of your books includes in its title “Photoshop Trickery & FX.” Photoshop as we know is a software program for commercial and fine artist, made by the Adobe Corporation. I think you’ve written at least 5 books, which is commendable. And yet, because there is a prejudice in some art circles where the though is that art made with computers and other digital tools like the Wacom Tablet, is not art—that the machines are the creators, not the people, when one sees a book about digital art software that includes the word “trickery” might that reinforce the stereotype that digital art is a gimmick requiring little or no talent? SB: That’s a good question–a good analogy. There are two aspects to my creative life, fine art and commercial art. The books support my living. All great artists have done commercial art to make money. It’s not to create fine art, but to sell a product. But I’ve done something different with my book. The book addresses a market to people who are trying to find their way in the digital creative world. Appealing to those individuals as to what can be done, with software like Photoshop and other digital software programs. Though in my fine are work, I try to take several approaches to creating. The book is not about using tricks, but instead about how to be creative. 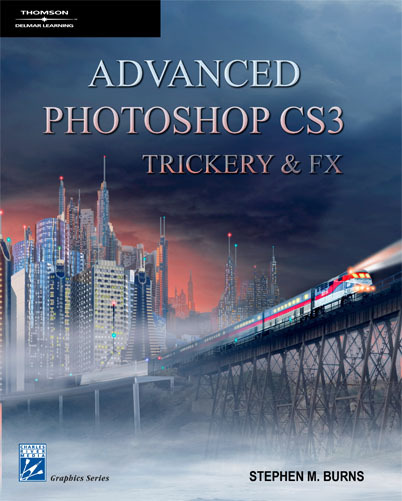 I’ve designed them specifically so that each chapter is a tutorial as to how to use Photoshop and that concept could be a variety of things—science fiction, weather theme, compositing, but all of my books deal with bringing together several types of software programs. I’m taking designers to the next step of creative possibilities. ME: Turning back now to another work of art that you did “Digital Ecstasy”, which seems to incorporate photography, painting and collage. I wonder about your photographic background—how much does it play with your painting and drawing skills? SB: I have friends who are painters, photographer and animators. And from being around these individuals, they have a tendency to create their work to reflect the tradtion of that work. What the computer to be is to produce a whole new breed of artist, creating something unique to a digital medium. But what I have seen instead is these people using the digital to basically do what they’ve always done. What I want to do is to blend all these things together. The computer can blend all these techniques—available to everyone to do photographer, film, writing etc. Now that all this is possible and available in one place iti produces opportunities to create a whole new product. When you look at my work, you can’t tell what it is, I want to integrate these things so well so as not to distinguish what tradition is dominating. As artist, this whole thing is about vision, not the software. The soft fascinates people. But the whole thing is about bringing out your unique personality through your medium. Whatever medium you choose. Have something to say and say it well with your medium. ME: One of the most painterly, abstract pieces that I see at your Chrome Illusion website is a work called “African Fury.” Last month I wrote an article entitled “Electronic Apartheid” which touch on oppression and disenfranchisement in the digital age—what that means for Black Americans and Africans. So what’s this piece about? SB: This piece is an influence of my trip to South Africa. When Johannesburg abolished apartheid they invited artist from around the world to have a dialog about integration. I was one of the artist invited to participate in the Johannesburg Biennale. I think is started in 1997. I was highly impressed by the raw nature, texture and aggressiveness of the Africans work. It’s a very complex country. ME: Everything that you do is so interesting—fascinating. Thanks for taking the time to speak with me. SB: You’re very welcome my pleasure. We’ll talk again. To view more work by artists interviewed here, visit the AD MAG Artist Galleries, and a full 3-year archive of AD MAG articles and interviews can be found here.